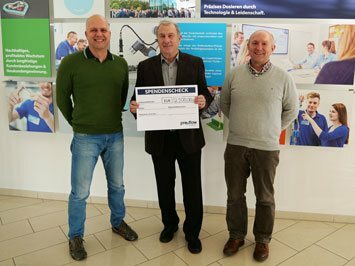 From left to right: preeflow manager Thomas Diringer, Weltkinderlachen board member Franz Trifellner and ViscoTec CEO Georg Senftl at the symbolic cheque presentation of the christmas donation. Christmas time is time for donations – the brand preeflow by ViscoTec also represents this principle. Every year at Christmas, preeflow donates to a charitable organization. In 2018, the foundation Weltkinderlachen® was chosen. With this donation, preeflow supports needy children from the home region of Altötting and Mühldorf who are dependent on outside help. 2500 euros were collected as part of the donation campaign. 2500 euros which help children in need to find their own way into life. More information about the organization “Weltkinderlachen” can be found at: https://www.weltkinderlachen.org/. Who receives the Christmas donation from preeflow is decided each year anew. This gives regional, national and international organizations the chance to receive financial support from preeflow next year.